Vintage bicycles generally use freewheels, and not freehubs, as part of their drive trains, although it is interesting to note that the first freehub was actually invented by the British company Bayliss-Wiley back in 1938, and used thread-on cogs. 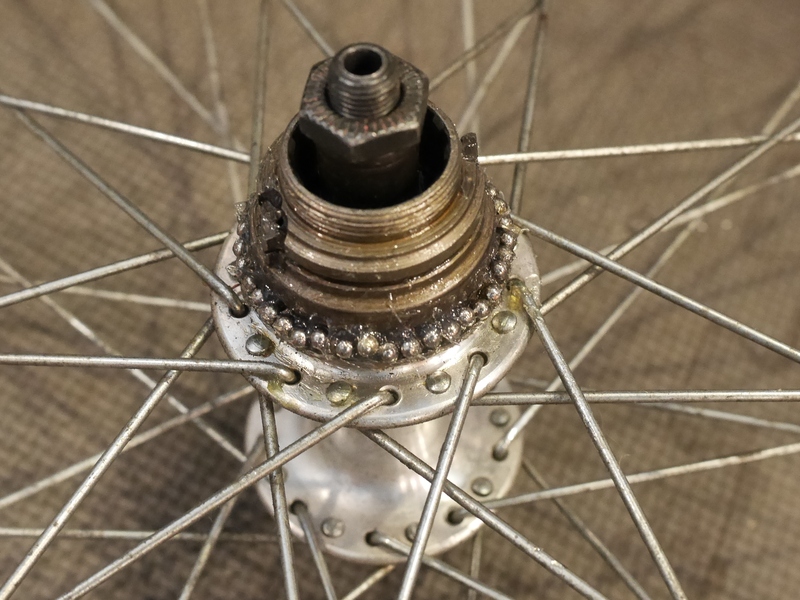 Later, BSA created a splined freehub in 1948, which was set up for 4 cogs. And, Stronglight, Maxi-Car, and a few other manufacturers developed and marketed cassette freehubs in the late 1940’s through the 1950’s. Shimano came out with its first freehub in 1978, and the rest is history. 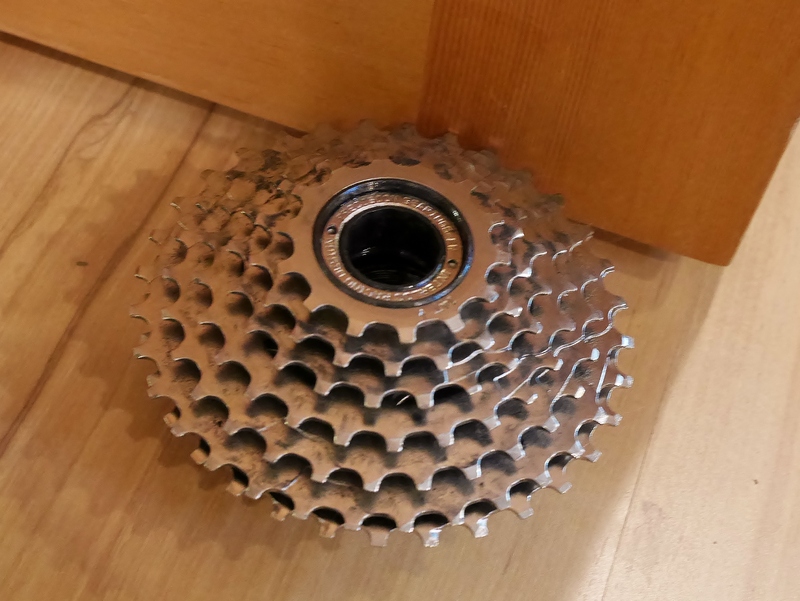 Freehubs with splined cassettes are now the standard equipment on all modern bicycles. 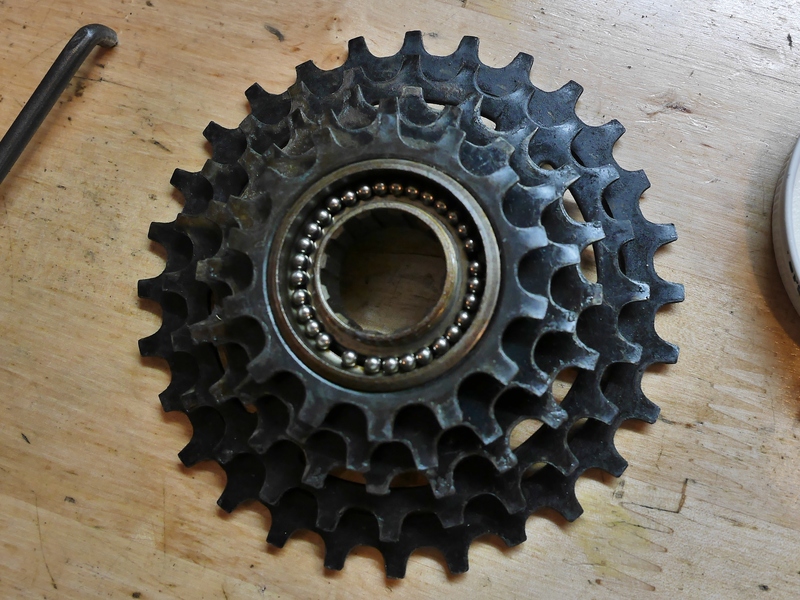 Shimano, Sunrace, Ventura, DNP and IRD still manufacture freewheels, but the style, number of speeds, and spacing of the cogs, as well as the overall width of the freewheel often makes them inappropriate choices for a vintage bicycle restoration project. Plus, weight and reliability can be an issue with any new non-Shimano freewheel (see below). It is still possible to find NOS or good quality used vintage freewheels, such as Suntour, Regina, and Cyclo, on eBay or even Craigslist, but sometimes the cost is just too high to justify the expense in dollars. I can attest to the reliability of virtually all vintage freewheels, having had no failures even after riding and restoring hundreds of bicycles. With a bit of lubrication, by dripping automotive oil into the space where the freewheel turns on its body, most freewheels can be brought back to their original functionality. 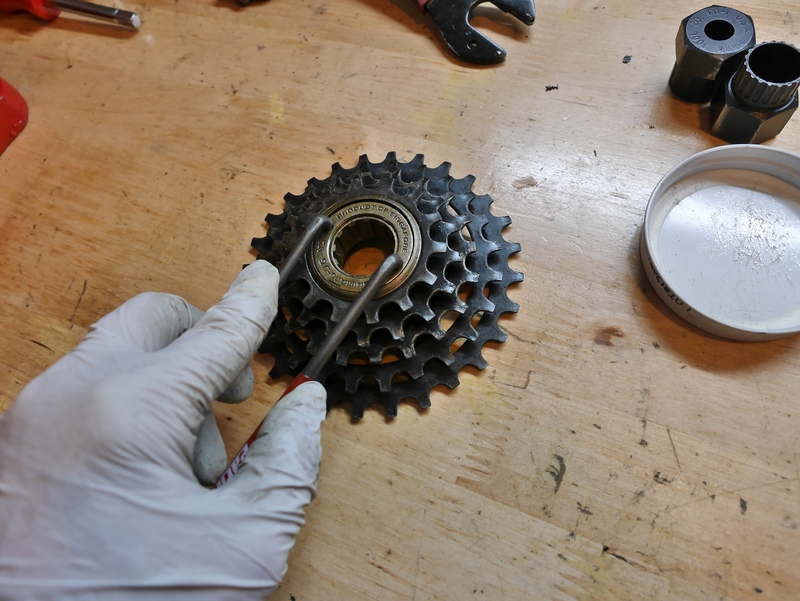 Sometimes, with a very dirty freewheel, I will first lubricate the body with a light oil, to clean the debris out, then follow that up with heavier automotive oil (the same 30 weight that I use for lubricating internal hubs). 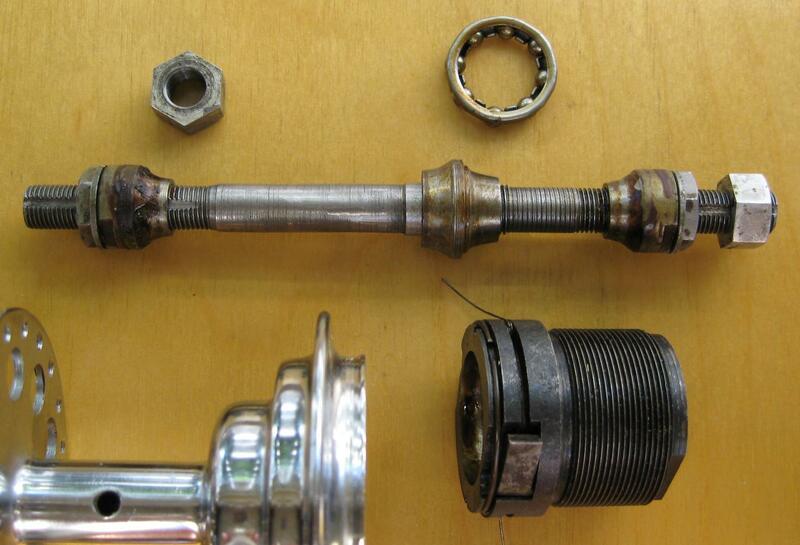 The 1940’s freewheel pictured above came back to life easily after this simple process. Some freewheels don’t even need that much attention. This 1929 Peugeot single speed freewheel with its helpful hinged lubrication port (part of the 1929 Griffon that I am restoring) didn’t require much lubrication – it was still working perfectly after 87 years of service! 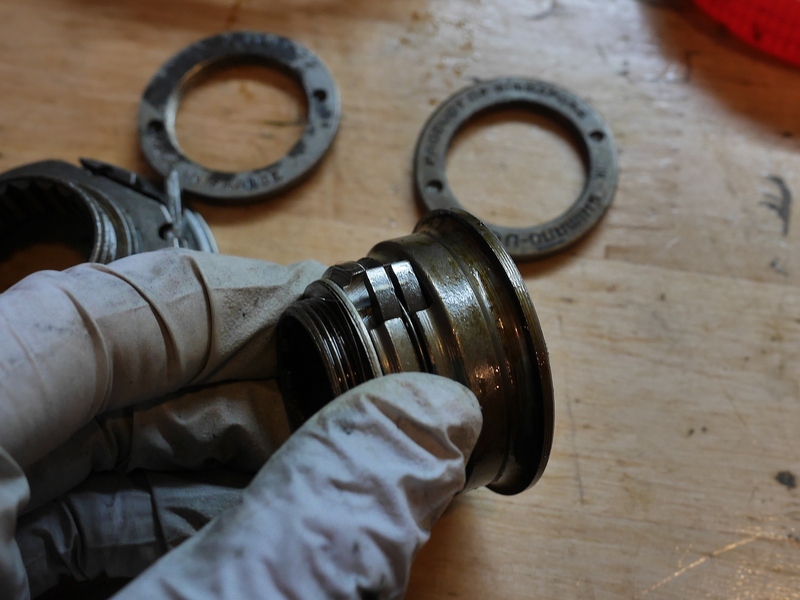 Freewheels require a precise bearing adjustment, accomplished by the use of spacers and the torque on the cover plate. 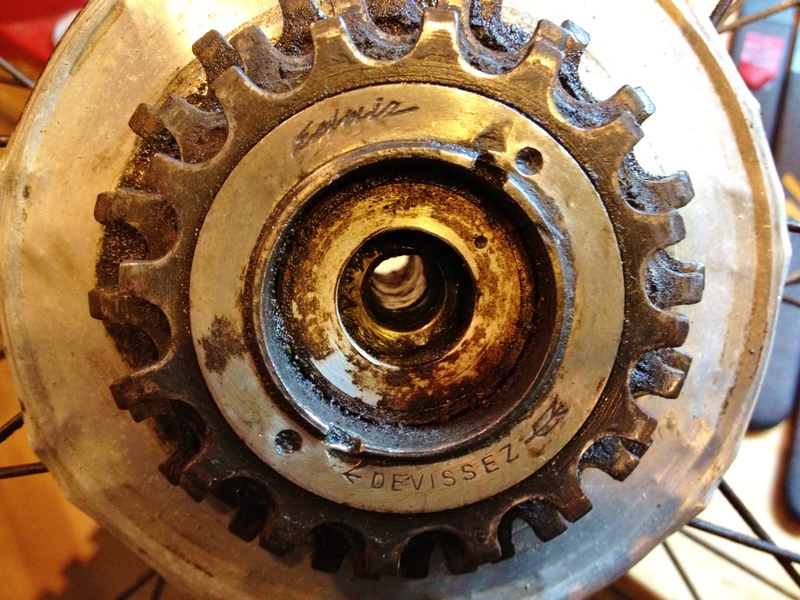 While pawls can wear out over time, the stress on the bearings themselves is quite low, compared to bearings found elsewhere on a bicycle, and that is one reason why so many older freewheels work perfectly with simple cleaning and lubrication. Hence, some mechanics have never found the need to perform a freewheel overhaul, myself included. 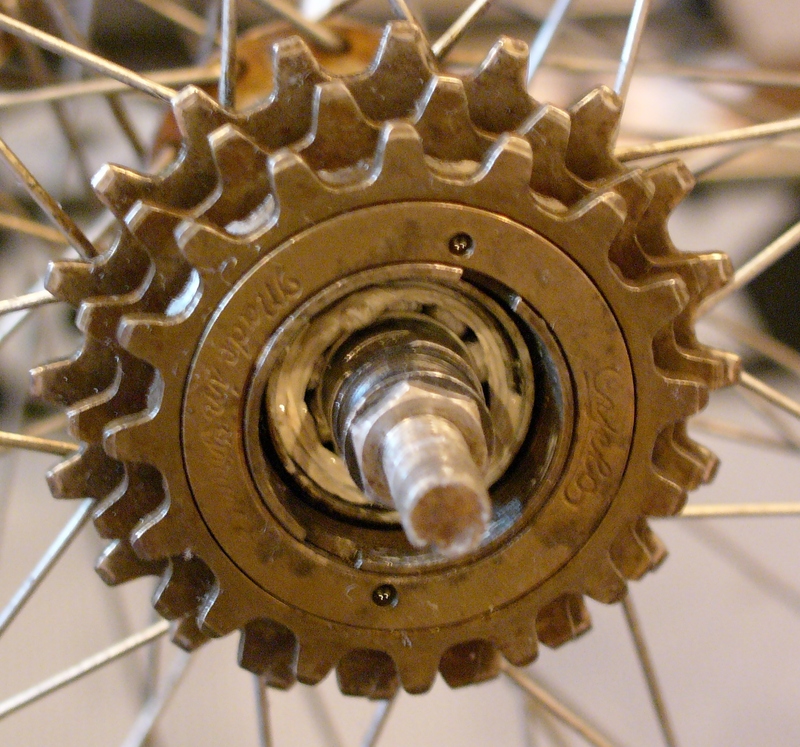 There are a number of resources on the web which provide detailed freewheel overhaul instructions. There is even a business called the “FreeWheelSpa” which has dedicated itself to this zen-like work. Not wanting to deprive myself of the joy of tearing apart a mechanical device on a grey, rainy Portland winter day, I decided to tackle the job myself. My Suntour New Winner 7 speed freewheel, installed on my winter bike, had begun making clunking sounds while under load, and grinding sounds while freewheeling. I replaced it with a different vintage freewheel from my dwindling stock so I could keep riding the bke, but before attempting to overhaul the Suntour freewheel, I decided to take apart a number of other vintage freewheels on hand, to make sure I understood the process. Possibly, this was a bad idea. 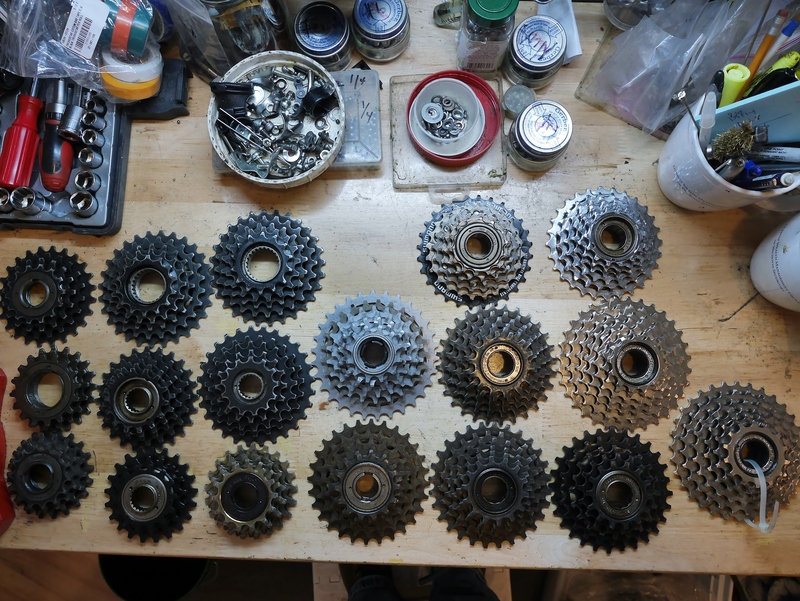 From left to right: French freewheels, including Cyclo, Atom, Maillard and Milremo, Suntour freewheels including Perfect, New Winner, and Pro-Comp, and various Shimano and Shimano copies, both vintage and new. I have a small collection of vintage French and English threaded vintage freewheels, plus a number of newer freewheels from Shimano, IRD, and DNP. This is an IRD freewheel that had previously failed after only a few hundred miles. I marked it with a zip tie so that I would never use it again. This seemed like the first obvious choice for an overhaul in my quest to master the freewheel overhaul process. Unfortunately, the cover plate on this freewheel could not be removed, even after much pounding on the cover plate with a punch and hammer. After that failed experiment I tried removing the cover plates on all the newer Shimano and Shimano copy freewheels on hand. In each case, the cover plate could not be removed, partly caused by the tinier holes present on the newer freewheels – which would not accept my Park pin spanner. Clearly these freewheels were meant to be tossed when they failed, part of the now de rigueur built-in obsolence doctrine in the cycling industry. 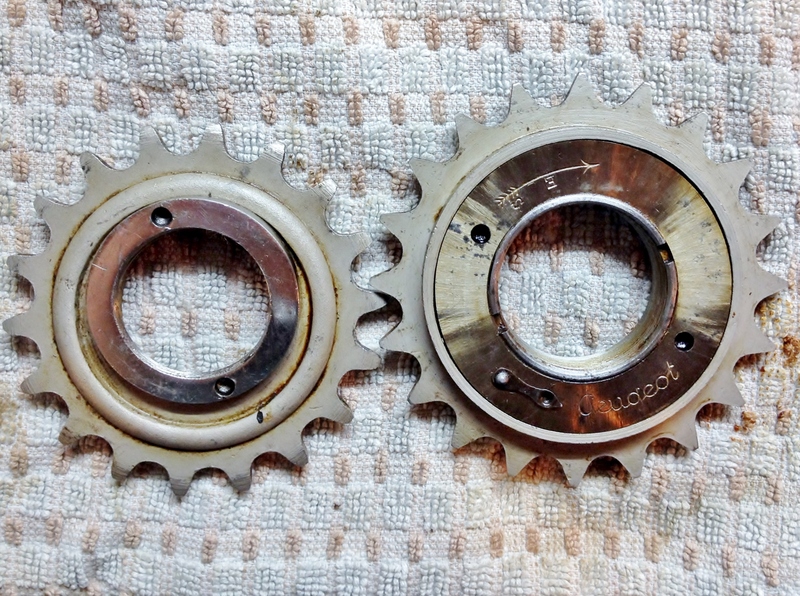 So I grabbed an early 80’s made-in-Singapore Shimano freewheel, and had no trouble at all getting the cover plate off. You need to mount the freewheel to a wheel first, before attempting to loosen the cover plate, so that the freewheel body is held in place. I used an old rear wheel with English threads that I didn’t mind abusing for this process. Once the cover plate is loose, you want to remove the freewheel off the wheel, and the take the cover plate off. The cover plate is REVERSE THREADED, so you turn it clockwise to loosen it. When the cover plate was off, I was able to see the first set of 1/8″ bearings resting quietly in the top cup of the freewheel body. There is another set of bearings at the bottom of the freewheel body. I used my magnet to remove the bearings, and placed each set of bearings in a separate container. I did not intend to replace the bearings, so I cleaned them with a little alcohol and let them dry out, planning to re-use them. 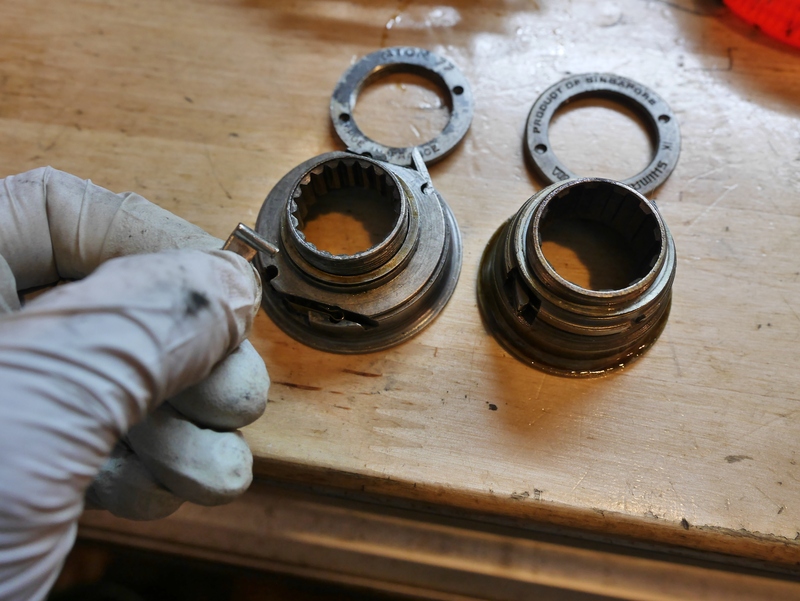 Then I applied a bead of grease to the lower cup first, and began the mindful process of placing each bearing back in its rightful spot. Maillard pawls on the left. 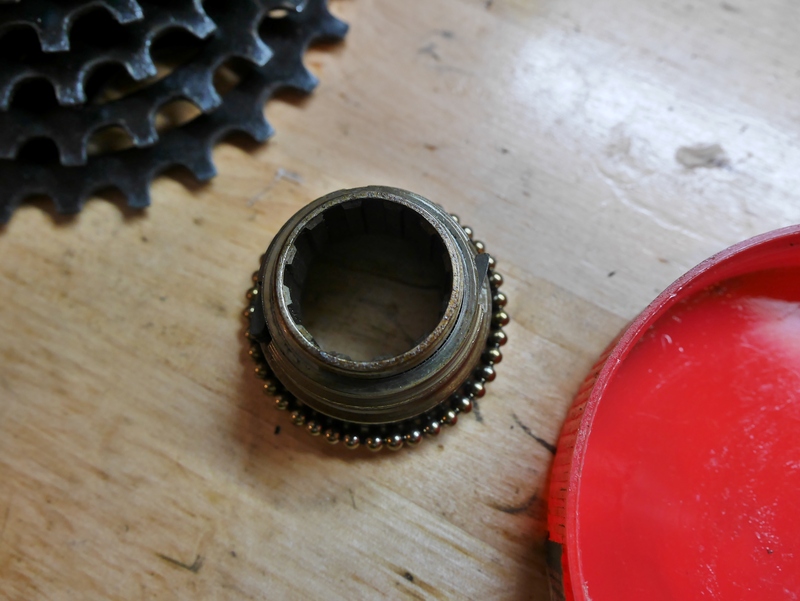 But, before doing so I noticed that this Shimano freewheel’s pawls differ substantially from this earlier Maillard freewheel that I had previously disassembled. The Maillard’s pawls are held in place only by gravity, and there is one pawl on each side of the freewheel body, but the Shimano has double pawls on each side, held in place with a clip. After the lower bearings are installed, you need to screw the freewheel body back onto the wheel, then very, very carefully put the freewheel cogs over the top, and seat the pawls. That’s where I ran into trouble, and decided to take a break before proceeding further. It can be quite tricky to get the pawls back into the ratcheting mechanism. Sheldon Brown used a technique involving a rubber band and some thread. Reading about it gave me a headache. Meanwhile, my failed IRD freewheel is taking up its rightful position as a doorstop. This entry was posted in Bicycle restoration, Freewheels and tagged Cyclo freewheel, freewheel failure, freewheel overhaul, IRD freewheel, Milremo Freewheel, Shimano freewheel, Suntour freewheel, Suntour Winner by Nola Wilken. Bookmark the permalink. Hmm. I mounted an IRD freewheel on my wife’s Raleigh during restoration. Later,I had read that some of them were defective. I’m keeping my fingers crossed. Hope the overhaul went well. I have used two IRD freewheels in the past few years, and both failed after a just a few hundred miles. I think they are adjusted too tight, and because they can’t be overhauled, they are pretty useless. As a woman who loves vintage bicycles and someone who would like to repair her bikes, I just want to say “I cherish your blogs and save everyone of them.” Keep up the excellent work!!!! I was interested in how you got started with your passion and your repair expertise, but maybe you have already share that and I have not found it yet. Thank you, glad you enjoy the blog. I’ve always been mechanically inclined which started at a young age when I would watch my Dad tune up his beloved Mercedes and some of his other cars. I learned how to do my own car repairs early on, and always worked on my own bicycle, even though I had no actual training. About 10 years ago I got some formal training from UBI here in Oregon, and later took a frame building class which turned out to be invaluable. Wow Did not expect a reply, but THANK YOU!! Sounds like you have had an interesting life. Really appreciate your sharing how you got started. Take care. How many bearings are there in each part of the freewheel? Each model is different so if you don’t plan to re use the bearings you will need to count them. I have torn apart dozens of freewheels and have always gotten the bearing race off on everyone of them. Use a drift punch. I also have literally dozens of shims, most need some shims removed to have very little play. You cannot tell how good or bad a freewheel is without overhauling the guts. Many have too much play in them. The other good reason for the overhaul is because if the chain is still good, it is already worn or mated to that particular freewheel. I rebuild bicycles, and everyone gets a freewheel overhaul. The main reason why freewheels are discarded here, is because the outside cog and some times the 2nd one wear out. It is too expensive usually to buy a cog for the freewheel. I get so many of them, from several bikes with bad wheels. I have even had bicycles that went through a flood, the freewheel was completely frozen, overhauled with new bearings, and they are like new again. Also when the bike is new it comes with grease not oil. The grease will last longer than oil. If chains are checked regularly and kept clean, freewheels, even a used one will go thousands of miles with a rebuild from time to time. 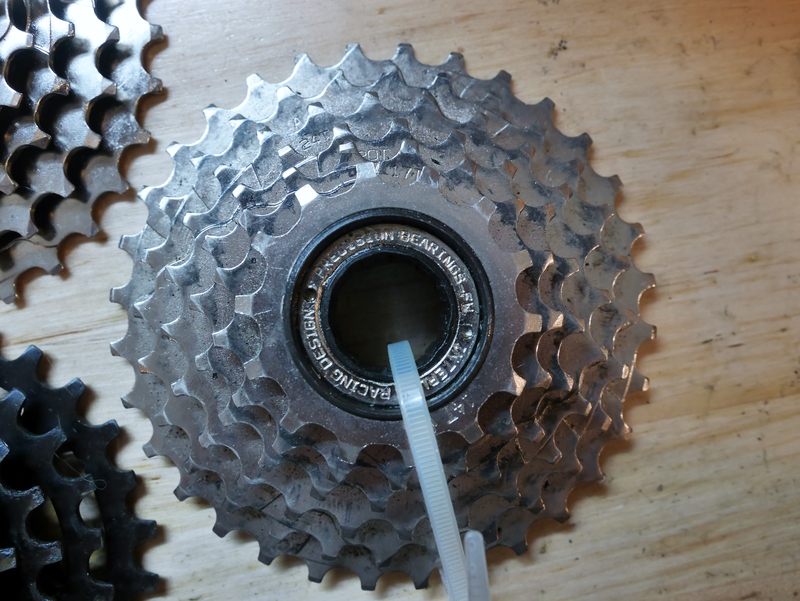 One more reason freewheels get overhauled here is because in 6-7 speed, especially the 6 speed, you cannot buy the same tooth count on the cogs from years gone by. For example, many 6 speed freewheels used to be 14×30, you can no longer by a new one like this today. You can get a 14×28 or a 14×34, at least in my searching. I have even overhauled the Helicomatic freehub/freewheel. Even newer freehubs have been overhauled here. Average time for freewheel overhaul is 1-1.5 hrs. I actually have a 5 gallon bucket of 5 speed freewheels from differing companies in differing tooth configurations. Interesting take on bike maintenance. Do any other readers also always overhaul the f/w as part of a restoration project? The newer IRD “Classica” freewheels are much improved. Mine has been great for a year and the shifting is quick and silent. The previous model (“Defiant”) failed because of weak pawl springs. Thanks for sharing your experience with the newer IRD freewheels. The Classica series is offered in 5 6 and 7 speeds, with a maximum 34 tooth cog on the 6 speed version. Hopefully they will prove to be reliable, but I haven’t tried one out yet. Great writeup, Nola! I myself am a passionate and 100% dedicated lover to vintage multi-gear bicycles, my favorite being racing bicycles. I have a vintage Fuji S12-S LTD racing bike that I truly cherish and I don’t see myself parting with it. As always, keep up the blog writing. I enjoy reading them. Vintage Mopeds and Scooters: the Precursor to e-bikes?